Circa 1910. "Michigan Central R.R. -- Electric engine, Detroit River tunnel." 8x10 inch dry plate glass negative, Detroit Publishing Company. View full size. Submitted by TahoePines on Wed, 09/19/2018 - 6:35pm. The boxes seen in various places on the engine are fuse holders. Big ones like those make quite a "bang!" and also quite the vigorous arc-flash when they rupture. Simple but effective; cheap as well. Submitted by signalman on Wed, 09/19/2018 - 4:12pm. The angled boxes are fuse holders, designed to direct the inevitable arc away from anything possibly vulnerable. And for SouthBendModel34, I have worked around energized third rail for many years, and with much less clearance than here. 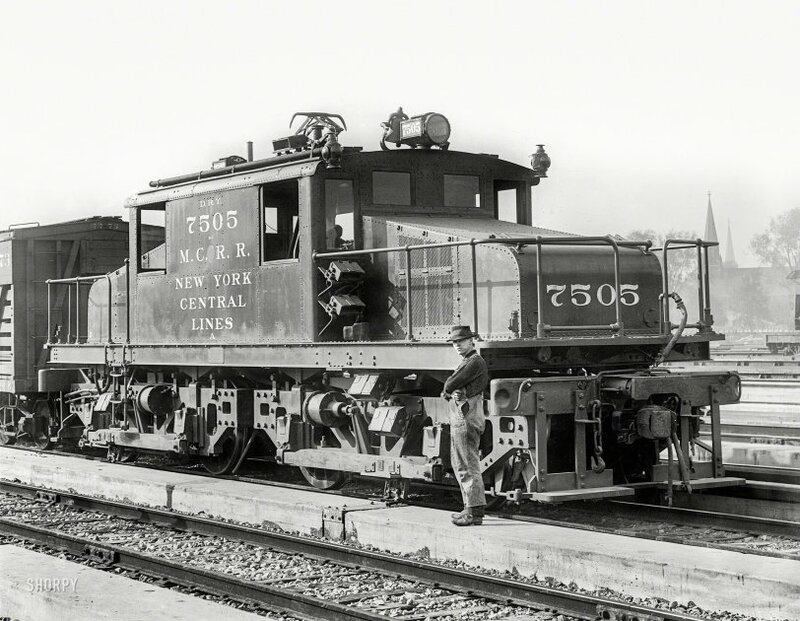 The angled boxes on the locomotive are what? Submitted by gsmith88 on Tue, 09/18/2018 - 9:13pm. Just below the engineer's window are two boxes, angled down. Two more are below the platform, between the man and the engineer's seat. And there's one more near the rear truck. What on earth are they? Thank you. Submitted by SouthBendModel34 on Mon, 09/17/2018 - 4:06pm. Under-running (bottom-contact) third rail. Third rail shoes are visible below the wooden beams on the trucks. The man standing on the ground is closer to a third rail shoe than I would care to be. The tiny pantograph on the roof is an alternate electrical pickup which will contact overhead bus bars in areas where track switches require long gaps in the third rail.